Ever been in the situation when you're out and about and you need to check something on your home computer? If so, TeamViewer is here to save the day. 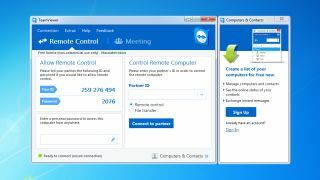 A free app that allows access to any PC or Mac from a smartphone or tablet, TeamViewer solves the aforementioned problem – and does it well. TeamViewer claims that they have over 200 million users in 200 countries and is free for personal use, relying on corporate plans to generate revenue. As a personal user, you get an ID and a password which links up with your smartphone, offering secure access from anywhere with signal good enough to support the link. With the advent of larger phones, such as the iPhone 6 Plus, working remotely while on the move is a possibility. Anecdotally, I have a friend who swears by TeamViewer and will even stream movies over the connection when on the move. While alternatives such as LogMeIn exist, they are paid-for and aimed at businesses as opposed to personal users. TeamViewer 10, released in December 2014, offers performance optimisations, a redesign, support for ultra-high resolutions, integration with Dropbox, optimisations for Windows 8 and OS X 10.10 and more – and all for absolutely no cost.